. Ryōgoku　両国 Ryogoku district and bridge 両国橋　. fireworks (hanabi 花火) festivals held throughout the nation. The biggest of these is the display over the Sumida River which is a major event on the cultural calendar of Tokyo, with spectacular multicoloured layers that blossom into the night sky to awe the millions of spectators gathered along the banks or in boats on the river. Many dress in traditional kimono and festival wear for the occasion. 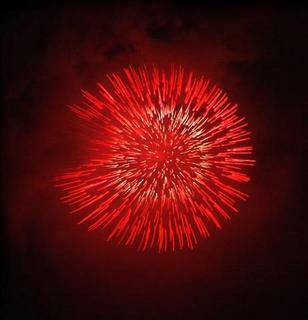 The highlight of the display is a dazzling competition between highly acclaimed fireworks manufacturers. The center of the activities is Sumida River Park and the banks of the river in its immediate vicinity where, from early in the day, spectators gather to secure a good spot for fireworks’ viewing. Others make reservations at office tower restaurants or with tour boat operators often as much as a year in advance. It is popular for spectators to attend the festival wearing the cotton summer kimono, the yukata, and to bring traditional Japanese food and drink. Hundreds of vendors sell refreshments, sparklers and souvenirs of the event. The Japanese word for fireworks, ‘hanabi’ is made up of two kanji characters – ‘hana’ for flower and ‘bi’ for fire. They were first introduced to Japan from China in the late sixteenth century and at the time, were enjoyed almost exclusively by the ruling class. Gradually, firework displays were held for the amusement of the common people and by the 18th century, they had become popular throughout Japan. There are over 7,000 fireworks festivals held throughout Japan each year. 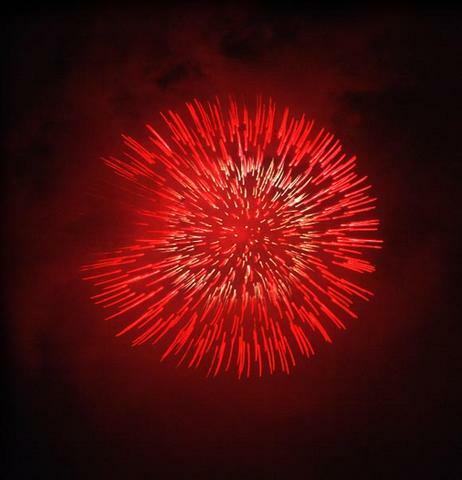 Many of today’s fireworks are being manufactured by the same families who began making them generations ago. This display done this way : Fired shells droped into the sea by pyrotechnists from rear of running motorboat one after another. Each shells sink once time and come up to the near surface again and blooming in the sea water. It look like gigantic half-doom. display at every August 10 . They color the night sky beautifuly. Fireworks displays and events are held various places in Japan throughout the year not only on summer nights. This page attempts to introduce attractiveness of Japanese fireworks and gives information of various fireworks. I hope you have the opportunity to enjoy Japanese fireworks. Take your time to surf through this one ! Here is a list of his fireworks pictures. You can see the different types of firework displays. See all the different types.
. Edo craftsmen　江戸の職人 - shokunin . One simple set was only about 25 Yen, more elaborate contraptions were 100 Yen. The first fireworks in Japan had been made in the 16th century, soon after guns were brought into the country. The oldest record of fireworks as a source of entertainment is said to be 1613, when Japan’s first shogun Tokugawa Ieyasu viewed fireworks in the Edo Castle. However, there are resources that also tell us that Date Masamune enjoyed viewing them back in 1589, or on April 14th of 1582 the Portuguese Jesuit Missionaries used fireworks at the church in Oita Prefecture. Furthermore, there is even a record that says fireworks were already used at a seasonal festival in either 1558 or 1560 at Yoshida Shrine in Toyohashi City, Aichi Prefecture. Hence, the history of fireworks display has not been made clear in its origin. As Japan entered the Edo Period – a closed and fairly peaceful era that lasted for 260 years – and the need of guns and gunpowder decreased dramatically, the unemployed people in the gunpowder industry made re-starts as fireworks factories. Fireworks back then were so popular among people from lay people to warriors, bureaucrats and shogun, that the government even issued a law that bans fireworks other than at Sumida River. 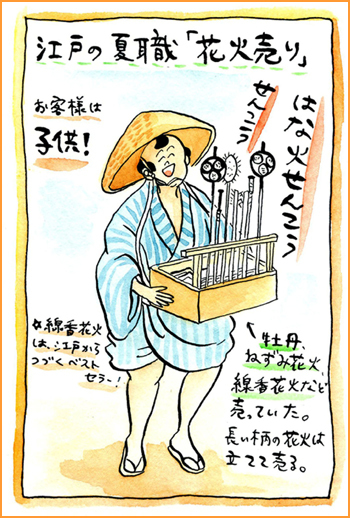 The most popular fireworks craftsman in those days was the Sr. Yahei (n.b. the name and thus master title “Yahei” has been succeeded in the following generations) of Kagiya. It is told that Sr.Yahei was not from Edo (present day Tokyo) but from Nara Prefecture (mid-western Japan) and was known for having excellent fireworks creating skills from when he was small. 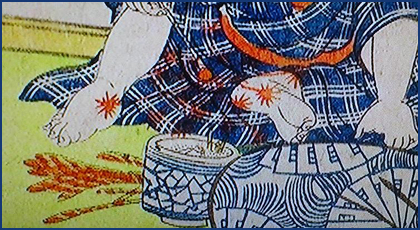 In 1659, Yahei became successful in Edo with toy fireworks in which he filled a reed-made cylinder with hoshi (gunpowder). Yahei continued to study and improve his skills, and opened a store called Kagiya in Ryogoku. In the following years, Yahei studied large-scale fireworks and showed his marvelous works at the Water God Festival in 1717. When the country suffered many deaths due to famine in Kansai (west) and cholera in Edo, the 8th shogun Tokugawa Yoshimune held a Water God Festival at Sumida River to console the souls of the dead, with Yahei’s fireworks. This is said to be the beginning of Sumidagawa Fireworks that continues to attract millions of people in Tokyo today. Another fireworks company that became famous and popular in Edo alongside of Kagiya was Tamaya. Tamaya was opened in 1810 by Seikichi, one of Kagiya’s assistant managers, as an independent branch of Kagiya. By latter Edo Period both Kagiya and Tamaya had made impeccable success in the fireworks industry in Edo. The Sumidagawa Fireworks was left to these two companies, the upper stream to Tamaya and the lower to Kagiya. When the fireworks spread in the night sky, the audience started to call out “Tah-ma-yaah” and “Kah-gi-yaah” on top of their cheers accordingly to which side of the river the fireworks were shot from, saying “this is Kagiya’s hanabi,” or “this is Tamaya’s.” This is the very origin of the famous phrase “Tamaya, Kagiya” that the Japanese shout out when viewing fireworks. However in 1843, an accidental fire spread out from Tamaya and burnt not only the store but also half the town. Back then accidental fire was considered a very serious crime, and because it was the night before the shogun left for a visit to a family shrine, Tamaya was given heavy punishment with all of its property taken and the master expelled from Edo. In those days, fireworks companies like Kagiya were called chonin-hanabi (townsmen fireworks). Besides those townsmen fireworks, there were private fireworks displays competed among feudal lords who had their servant craftsmen make hanabi for them. These are called buke-hanabi (warrior’s fireworks). Warrior’s fireworks were especially popular and gorgeously held in the three domains Kii, Owari and Mito where there were no restrictions in fireworks productions for the domains were ruled by the Tokugawa (shogun) family. 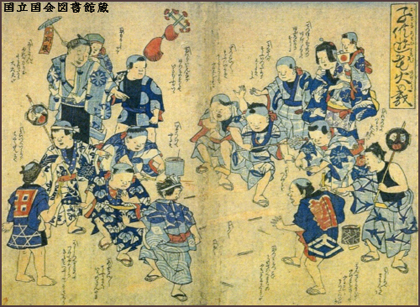 The warrior’s fireworks of the Date Clan was also known to be great, reflecting how the clan prospered the most for the first time after the historical figure Date Masamune. It was so popular that in fact, the reputation spread to Edo and people flooded over destroying a bridge nearby the site. Warrior’s fireworks originated in war signals, therefore developed as fireworks that shoot up high in the sky. As compared to the rather flat fireworks of Edo which were more art-oriented (colors, shape, tricks) the warrior’s fireworks were more plain but grander in scale. Fireworks that Japan enjoys today have taken in both these elements, and developed into a unique high-skilled art. 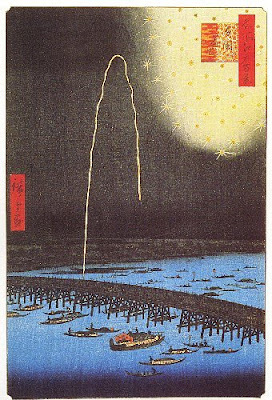 According to Muto Teruhiko (1921 – 2002), the founder of Japan Fireworks Artists Association (JFAA) and a writer of innumerous documents related to fireworks, uchiage-hanabi (the kind that goes high in the sky and is meant to be displayed in the air) was developed in 1751. What people may have believed to be uchiage-hanabi before then were smaller fireworks that shot out sparks and smoke. On a side note, Kagiya’s 13th generation owner and master Amano stopped producing hanabi (handheld fireworks) during WWII, and has become a uchiage-hanabi-only company since then. The world's leading fireworks manufacturers consider the HSBC Celebration of Light international fireworks competition to be the most prestigious events of its kind in the world and an exciting arena where they can unveil the latest pyro-musical techniques and the most innovative fireworks materials. In Belgium, it would be a strong kigo for Independence Day (21 July), which is also the King's official birthday and a public holiday for all. Fireworks are held in the Royal Park, opposite the city palace, and everyone is invited to watch. Every commune also holds its own fireworks and, as they take place at staggered intervals, one could theoretically move from fireworks to fireworks that night (I did watch two sets one year...!). Fireworks play a big part in the New Year's celebrations (midnight for the start of the new year) and would be another kigo then. Only public fireworks are allowed. In Ireland, fireworks are rare and, if they take place at all, they are public fireworks. We had a wonderful display for new year 2000, and more recently on 1 May 2004 for the enlargement of the European Union (Ireland had the Presidency of the EU). Fireworks would not be a kigo in Ireland, but are much liked. Fireworks in the US are H-U-G-E for the 4th of July celebration, but are rarely used at other times. On the 4th, however, there are at least 6 fireworks celebrations that can be seen with the naked eye from atop Signal Hill near Long Beach California, and probably 2-3 times that if you used binoculars. As you can see from the following link, almost all the fireworks displays that they list are within a week of July 4th. Some of the theme parks, like Disneyland, do nightly fireworks during the summer, but the Queen Mary here in Long Beach quit doing their nightly fireworks.Fireworks do get used for special celebrations such as the Olympics' opening and closing ceremonies (e.g. 1984 Los Angeles Olympics). In the United Kingdom, a sparkler is often used by children at bonfire and fireworks displays on Guy Fawkes Night, the fifth of November, and in the United States on Independence Day (United States). "peony in the hand", a kind of "incense stick firework". The sparks seem to fall like raindrops from an umbrella, first in a silver tinge, than changing into a golden tinge. The Tengu from 倉尾村 Kurao in Chichibu, Saitama often launch a firework from their rock called 天狗岩 Tenguiwa. But it does not make a sound at all, just beautiful colors like chrysanthemums in the sky.
. Tengu 天狗 "heavenly dogs" from Chichibu .
. kitsune 狐 fox legends . From 御殿場 Gotenba in Shizuoka an old farmer could see something like a firework up on the fifth station of Mount Fuji 富士山の五合目, and even hear the noise of its popping. But he knew he was only bewitched by a fox and begun to pee on the roadside to get rid of the bewitchment, as was custom in this area. Indeed, when he finished his pee, a fox showed up at the side of the road . . . and he was healed. In 中津川村 Nakatsugawa in Yamagata in the hamlet of 大別 Owakari there are foxes stealing the special food for the New Year. From near and far they play pranks on people for about 30 minutes, showing up like a firework. In 福島県 Fukushima before a fire of a home there is often a sort of firework to be seen. It looks like a comet falling from the sky, sparkling and dancing and disappears quickly. In 瀬戸内村 Setouchi village in Kagoshima there is a special mysterious red fire ball called ヒジャマ hijama. It is about 20 cm in diameter. It appears above the ocean and sparks around like a round firework, but it never has a trail at its end. Before it falls, it becomes like a long pole, slipping into the sea. 化かすんじゃない - Don't fool us! it disappears soon. Another link to a beautifully illustrated Haiku and Hanabi page by students. My heart is also rainbow‐colored. Kagiya and Tamaya were famous firework producers during the Edo period, see above. ichimon no hanabi refers to the small sticks or paper stripes (senkoo hanabi 線香花火 "incense stick firework") which children can hold in their hands and swing around to form patterns. This hokku is from the 9th month (October) of 1821, when Issa was living in his hometown. It seems to be a hokku based on a memory of what he saw in Edo. 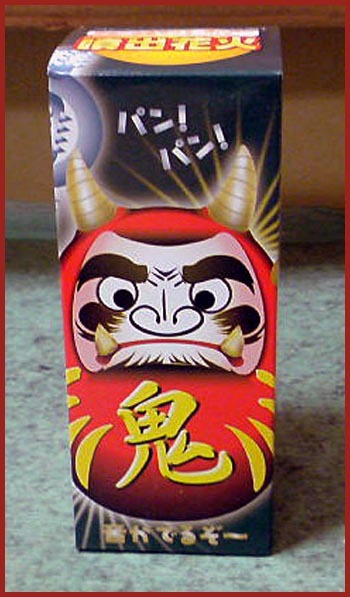 The hokku is about the great love Edoites have for various kinds of fireworks. By implication, it's also about their strong desire to experience all sorts of new forms of innovative entertainment. In addition to the many commercial boats that constantly crisscross the Sumida River in Edo, every evening in late summer and early fall the great river is covered with hundreds if not thousands of pleasure boats hired by people wanting to cool off after a hot, humid day, while even more people crowd onto the banks of the river and onto the various bridges that cross it in order to see the sights and catch some cool breeze. Between the passenger pleasure boats constantly pass other boats selling food, sake, personal goods, and fireworks. The fireworks boats row here and there, stopping whenever a pleasure boat hires them to perform a program of small and medium-sized fireworks. On some nights between 5/28 and 8/28 (July-September) there were periodic and spectacular displays of large-sized fireworks sent up over the Sumida River at Ryogoku Bridge, near the largest entertainment district in Edo. Two different groups of fireworks artists competed with each other, resulting in long displays of fireworks exploding high over the river in many complex patterns and colors. Even on nights when these displays are held in the sky, however, Issa writes that the ordinary fireworks boats continue to do a good business down on the river. Their more modest explosions seem to be just as exciting when seen from nearby at water level, and they are viewer-friendly, since customers can ask for the types of fireworks they like best. 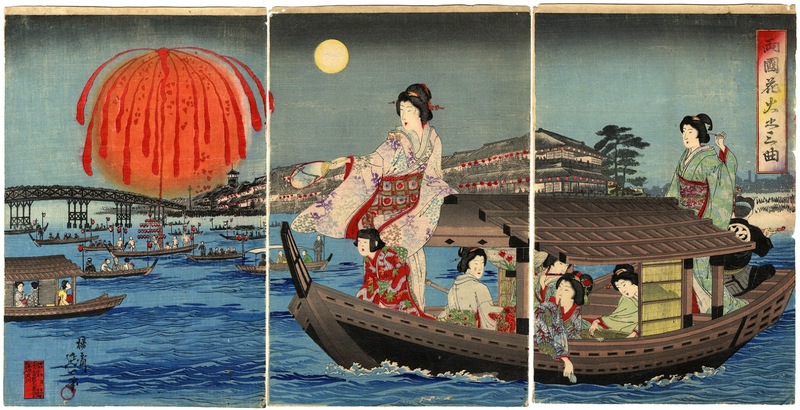 The hokku presents a double vision of both the sky and the water being lit up simultaneously. Arai was the 31 station of the Tokaido road. The Omagari National Japan Fireworks Competition(大曲花火大会) is held every year on the 4th Saturday of August on the dry bed of the Omono-gawa, a river in the city of Omagari, Akita Prefecture. More than 30 firework makers from all over Japan compete to show off their technique. More than 600,000 people comes from all over Japan to view the big breathtaking fireworks. A feature of the competition in Omagari is that the firework artists launch fireworks that they have made themselves. The fireworks competition started in August 1910 when fireworks were an attraction of the festival at the shrine Suwa-jinja. 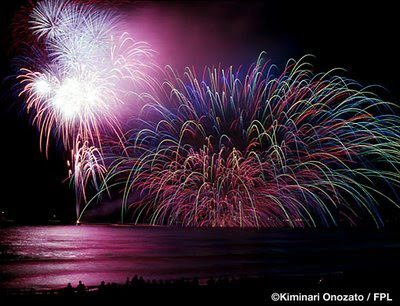 Omagari in Akita Prefecture will hold the 83rd edition of the Omagari fireworks display this year. Being recognized as one of the most prominent fireworks displays in Japan, it attracted an audience of 650,000 to the Omagari district - which only has a population of roughly 40,000 people - in Daisen City last year. The official name of the fireworks display in Omagari is the "Zenkoku Hanabi Kyogi Taikai (National Fireworks Competition)." In the competition, a number of fireworks craftsmen selected from all over the country compete in three categories: "hiru-hanabi (day fireworks)," "10-go warimono (shakudama, which are 12-inch round shell fireworks)" and "sozo-hanabi (creative fireworks)." Only those fireworks craftsmen who have enough skill to make shakudama shells with a central pattern - a skill that requires a great deal of ability - are allowed to participate. Omagari was the first competition in Japan to incorporate "sozo-hanabi (creative fireworks)" as one of the categories for its evening display in 1963. It is said to have been born from the efforts of the fireworks craftsmen and the question "Why are all fireworks round?" that occurred to the Chairman of the competition at the time. 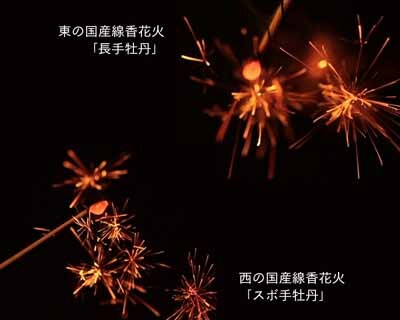 In this category, "katamono (pattern-shaped)" fireworks that form various kinds of shapes such as letters of the alphabet, a pair of glasses or animation characters created as a result of thinking outside the box decorate the sky. In recent years, fireworks displays are sometimes orchestrated to music, offering greater enjoyment to the audience. At a tea house in Yodo. The rain is good and bad: good for crops, bad for fireworks. The mon was the basic currency of Issa's time. It took the form of a coin with a hole in its middle so that it could be strung on a string. In Issa's day six mon could pay for a bowl of rice.